ALEX PARDEE'S LAND OF CONFUSION: "ADVULTURE TIME!!!!" While in NY, photographer Chloe Rice and I noticed a strange species of upright Vultures lurking around, feeding off of discarded socks with meat in them, digging through garbage, and fighting humans with swords. We decided to follow one, and it turned out that said vulture was on a quest for a decapitated human head filled with rubies. What followed was a voyeuristic journey through rain, wind, soot and bum-feces as we embraced the new experience of discovering a legendary species of animal: The Advulture: A human/vulture hybrid that lives for adventure. Inspired, Chloe went back out hunting and photographed some other advultures as I stayed in and painted what I imagined they would dream about. 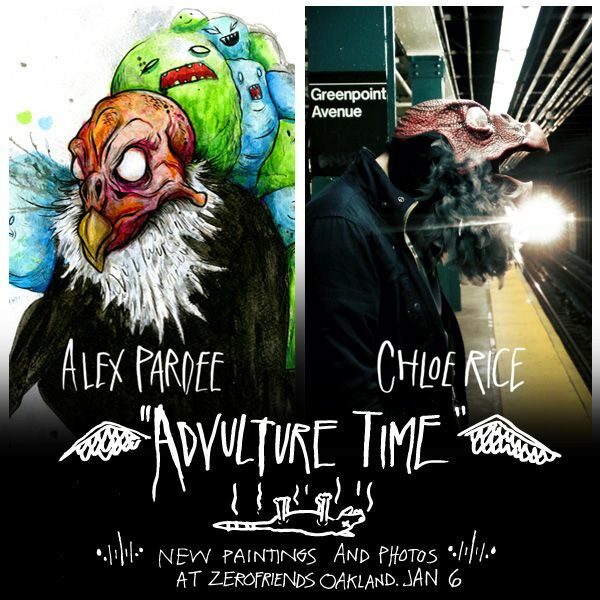 Tomorrow, Friday Jan 6 at the ZEROFRIENDS Retail Store/Gallery in Oakland, I will be displaying a small series of new Advulture paintings alongside a series of Advulture photos that Chloe will be displaying. And as usual, the Zerofriends retail store will be open and we have a ton of new stuff for sale. I will be at the opening so come say hi. See you there! Skinner Art Book UNLEASHING THIS FRIDAY! "BUTCHER KINGS" Original Paintings on sale! I'm Painting LIVE in San Antonio this SATURDAY! New Art Show In SLC This Friday! The (ADVULTURE) Time Is Now!